I want to start this thread to get some opinions and ideas from the community on how the Auroracoin foundation can promote the coin in Iceland. Of course we already have some ideas and plans for what we can do but I'm sure many of you guys have great ideas that we haven't thought of. So we like to hear it. This can be any kind of publicity you can think of and it can include Aur giveaways. Perhaps this idea is not that hard to implement? Auroracoin treasure hunt. Remember Casascius physical bitcoins? They are so desireable they carry a huge premium over face value on eBay today. Perhaps beautifully designed physical auroracoins could be an effective promotion. I think that the primary communication target are the early adopters. In the beginning It will be nice to organize few meeting where the blockchain technology could be discussed. Also it's important to video record the meetings and post them on a youtube channel with translation for people to see. The easiest way to promote AUR is using social media AD's like boosted FB posts. The foundation need a active social media management. Bimmerhead wrote: Remember Casascius physical bitcoins? They are so desireable they carry a huge premium over face value on eBay today. I'm actually having some physical coins manufactured for me but just simple ones that are mainly just for show. They can not hold actually hold aur. The main idea is to use those I'm making to take some good pictures for promotional material and as a prop when we have some events, meetings etc. But if we like to have some physical coins that can actually hold some Auroracoin, we can check with Denarium (https://denarium.com) which is a Finnish company that is manufacturing physical coins for Bitcoin and see if they like to cooperate with us on this. Yes, I think that paper wallets might be a good way to distribute the coin in all sorts of promotion. sorin wrote: I think that the primary communication target are the early adopters. Education about Auroracoin and the blockchain technology is one of the core functions the foundation has so we definitely will start with some meetings for interested people then move on to contacting schools, companies and other organisations to offer some introduction in these places. sorin wrote: The easiest way to promote AUR is using social media AD's like boosted FB posts. The foundation need a active social media management. Absolutely, we will start here but will need to find someone who is willing to take this full on. Skarfurinn wrote: I'm actually having some physical coins manufactured for me but just simple ones that are mainly just for show. You continue to surprise me Skarfur. "The foundation need a active social media management." Question: Which social media sites/pages does the foundation have control over? We have control over Facebook.com/auroracoin, the most important one I think since 70% of Icelandic people use Facebook! I'm actually not from Iceland and I'm still wondering what this "f"-symbol in the Logo means? Does it have something to do with aurora? If you have any interest I might assist you with some Graphic Designs..? All help is more than welcome. The "F" in the logo is the Fé (Fe or Fehu) rune. Which symbols money or wealth. Fé means sheep or cattle and in the old days that was a persons money or wealth. I ones tryd this: ...but I like the Fé! For NLG we made coin stickers with the old Gulden/Guldencoin symbol on it and are still in the process of putting it on coins and use those coins to pay at stores. It contains a link to a site where the Dutch can claim their 100NLG. Maybe we could do something similar for Auroracoin (within Iceland). 208 wrote: Ah, good to know! It's a good idea. But like you mention yourself the fé concept is quite good if you know what it means. I can understand a lot of people scratching their head over the "F". BioMike wrote: For NLG we made coin stickers with the old Gulden/Guldencoin symbol on it and are still in the process of putting it on coins and use those coins to pay at stores. It contains a link to a site where the Dutch can claim their 100NLG. Maybe we could do something similar for Auroracoin (within Iceland). I'm not sure how the claim for the NLG is. Can you claim multiple times if you have multiple claim links or do you have some ways to identify the user so he can just claim once? NLG claim is 100NLG per Dutch person (validated by ID if I'm correct). But you don't have to claim, the site contains a lot of links to NLG resources. It's just a general landing site. 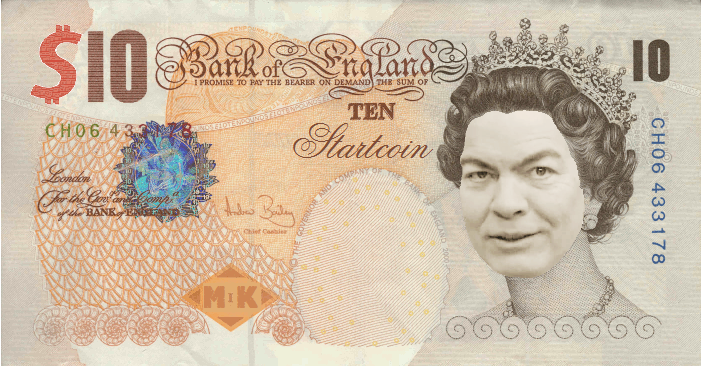 Funny how I never noticed before how much queen Elizabeth has a striking resemblance to Max Keiser.